Impression of the new wind farm. Saudi Arabia on Thursday awarded a contract to build a $500 million wind farm, a first for the world's top oil exporter as it pushes to diversify its energy sector. A consortium led by France's EDF and Abu Dhabi's Masdar won the bid for the 400-megawatt Dumat al-Jandal wind project in the northern Al Jouf province, the Saudi energy ministry said. 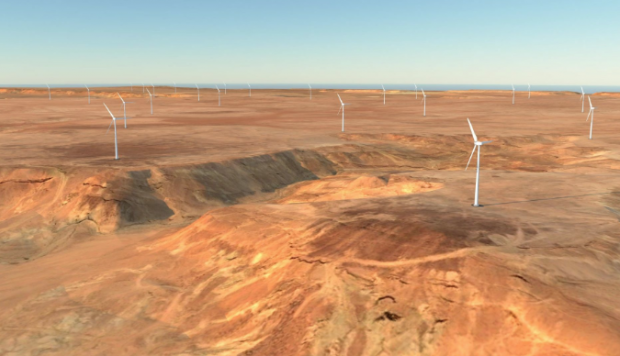 "The project will be Saudi Arabia's first utility-scale wind farm," the ministry said. "This milestone represents another significant step... towards creating a diversified power sector mix." The project will generate power to supply up to 70,000 Saudi households, it added. Thursday's announcement comes a day after Opec kingpin Saudi Arabia said its huge oil reserves, already the second largest in the world behind only Venezuela, are even bigger than previously thought. The energy ministry said proven oil reserves stood at 263.2 billion barrels at the end of last year, up from the figure of 261 billion barrels that has been used for almost three decades. But Saudi Arabia and other Gulf monarchies have been looking into ways to cut their energy bills and diversify their power sources away from oil, their main export commodity, as prices continue to fluctuate after the 2014 market crash. Virtually all of Saudi Arabia's power currently comes from crude or refined oil and natural gas. Crown Prince Mohammed bin Salman last year unveiled plans to develop the globe's biggest solar power project in partnership with Japan's SoftBank group, which is estimated to cost $200 billion. The memorandum of understanding seeks to produce up to 200 gigawatts of power by 2030 - about 100 times the capacity of the current biggest projects.